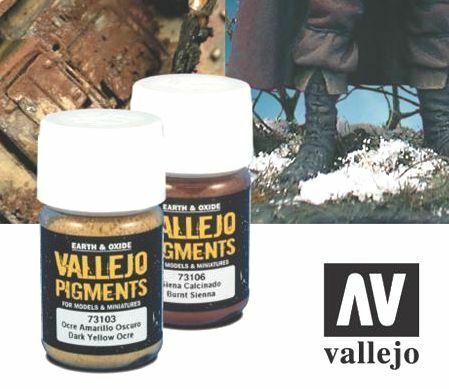 These pigments can be used for weathering and ageing the finish of model vehicles, armour, fortifications and structures. They are ideal for creating the effects of accumulated dust, mud, dirt and smoke produced by time and natural erosion. To permanently fix the pigment to the surface of the model Matte Medium is used, or Glaze Medium which dries more slowly and allows more time to simulate water and snow run-offs and to move the pigment into and around the details of the model. Many other special effects can be obtained by mixing pigments with products in our Water & Stone range as for example with Transparent Water to achieve effects of oil and grease stains, or Sandy Paste to create a rough, coarse surface for heavy dried mud or flaking deep rust. · Use this pigment for ash, snow and metal fatigue effects.